This is not your grandmother’s roller derby! Today’s roller derby made a comeback starting in 2001 in Austin, Texas. There are two types of derby, banked and flat track and we play on the flat track. A bout involves two teams of five players at a time each skating in a pack-style counter-clockwise direction. 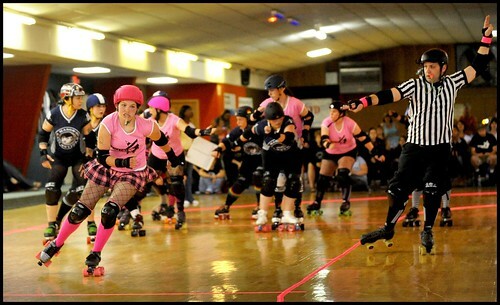 The two positions in roller derby are blockers and jammers and the pivots are blockers that set the initial pace at the start of the jam. To learn the official rules of derby, visit the Women’s Flat Track Derby Association. How old do I have to be to join the Blackwater Rollers and what are the requirements? The only thing we require of you is that you are at least 18 years-old, have health insurance and love skating, being a part of a team and showing off your tough side! The team is made up of a collection of girls from all ages, interests and stages in life. Everyone is welcome! The team, of course, is made up of all women, but we are also looking for guys who want to become refs. They are a huge part of our team’s success! How dangerous is roller derby? Just like any other contact sport, there’s always a chance you will get hurt in roller derby. Pulled muscles, rink burns, strains, sprains, bruises, broken bones could and will happen. However, with proper training, stretching exercises and protective gear, we hope to keep major injuries at a minimum. There are also rules and regulations to the “hitting” that goes on in derby. All of that being said, this is why health insurance is a must before we can allow you to skate with us! It is for your own good! I haven’t been on roller skates in 10 years, can I still join the league? Absolutely!!! All of us have been new skates at one time or the other so don’t be scared! We will help you get back on your skates and rolling again! The best thing to do is start off attending open public skates at Funquest until you are more comfortable. Ask any team member and they would love to give you tips and help you aquire your basic skills! For safety, all girls must have a helmet, elbow pads, knee pads, wrist guards and mouth guards on before they are allowed on the rink. These must be worn during practices, scrimmage games and bouts. If you are new, don’t worry, we have pads you can borrow as you try out derby! AJ’s will also rent you skates before your purchase your own. You will need speed skates however, no inline skates allowed! What does it cost to be a derby girl? To start out, you will need to get your own skates and pads. To get good pads, it may cost you around $100. Depending on what skates you buy, they can range from $75 to $300. We can help you find deals and recommend specifics brands. There is a monthly league fee that helps cover the cost of renting out the rink. The cost may go down over time but is currently $40/month. As a team we also do fundraisers to help cover this expense. The more you are on your skates the better! Currently the Rollers practice on Tuesday and Thursday nights at 6:30 at AJ’s Skateworld in Appomattox. Many of the girls also skate at open public skates at Funquest during the week to work on their skating skills. Try out Monday nights until 8:30 and there is a good chance some of us will be there. There are also the occasional meetings outside of practice. Pad me up, I am ready to skate! Now what do I do? Email us at blackwaterrollers@yahoo.com if you have any more questions and then just show up and skate! If you are ready to try out an official practice, show up before 7:00 on a Tuesday or Thursday night at AJ’s Skateworld! It will only cost $5 for your first two practices as you try it out and see if you are ready to join!